Although many people investigated about this case and they even said that the creature was an extraterrestrial creature and many other things. Sometimes the explanation of an alleged mystery is very simple. Nothing better to transcribe the explanation of something that it’s not a mystery anymore. 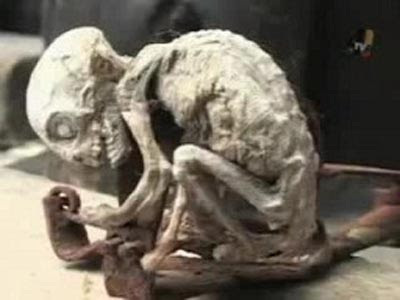 The Mexican television showed a strange deformed being caught in 2007 by a farmer Marao Lopez, this farmer found the strange creature in a trap for animals, but he was afraid and he drowned the creature. The death of this farmer could not be clarified and it is suspected that his death has connection with this case." Ruanel: He was a terrestrial baby. Interlocutor: But how did he appear in that place? Ruanel: The mother simply abandoned him. Interlocutor: How old was the baby? Ruanel: The baby was less than one year old. Interlocutor: So the mother raised him during almost one year and she decided to abandon him? Ruanel: Correct, she hid the baby at all times from her family. Interlocutor: And she simply abandoned without any remorse, as one commonly says, nothing to do with extraterrestrials. Ruanel: Correct, there is nothing related to extraterrestrials. Interlocutor: Was it a karmic issue for this spirit? Ruanel: It was a karmic issue for both, for this spirit and for the mother. Interlocutor: I suppose that none of them embodied again. In what spiritual plane is this being's spirit? Ruanel: He is in the plane 4.1, so he is a Master Spirit. The mother didn’t embody either and her spirit is in the plane 2. Interlocutor: Did this Master embody knowing that his organism would be teratological? Ruanel: Yes, of course! The spirit knows how the genetics of his body will be. Interlocutor: I understand. Did he have some mission to be born in that way? Ruanel: Yes, his mission was to try to teach with his deformity to his environment, something he didn't accomplished. Ruanel: Correct... Obviously they killed him due to their superstition. Interlocutor: Definitely it was only a murder, beyond the heinous circumstances that could exist for those who killed him. Interlocutor: Is there something else to add about this case? Ruanel: No that is all. This entry was posted at Wednesday, November 11, 2009 and is filed under Mysteries and Enigmas . You can follow any responses to this entry through the .